Hold down the Ctrl key on your keyboard while rolling the scroll wheel on your mouse. 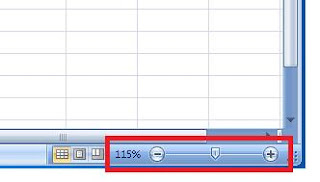 Rolling the wheel forward will zoom in (will make the spreadsheet or document appear larger), while rolling the wheel backward will zoom out (will make the spreadsheet or document appear smaller). There also is a zoom tool in the lower right corner of the Excel or Word screen (see figure below). Just click the “+” or “-“ buttons to zoom in or out. You can also move the slider (in between the “+” and “-“ buttons) left or right to zoom in or out.